I ordered some of these a few weeks ago and they are extremely nice! 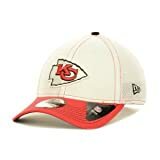 Amazon has the NFL 39Thirty fitted hats on sale for as low as $6.25! These retail for $25. Teams usually sell out quickly, so order fast!